Yesterday we passed our electrical inspections and my husband called for the final inspection upstairs. I didn't expect them to schedule it so soon, but the codes inspector arrived today. He looked around, checked things out and passed everything. So all our permits are finally closed out. We can unpack the upstairs and finally put the kids in their rooms. The oldest is especially thrilled at the prospect of not rooming with his sisters for the first time in over a year (and who can blame him?). After all this time, I'm really looking forward to unpacking and settling in. And on another house note, thanks to Jeanne for making me glad we put in wooden and not granite countertops. Show everyone a closeup of those counters. They are so fabulous! Yay! You must all be so happy. Your kitchen is beautiful. Thanks for the heads up about granite countertops - I had never heard about that. 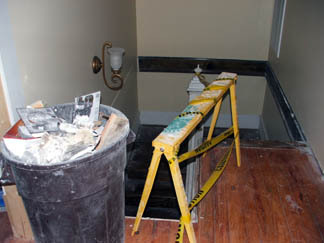 ok, that is an interesting article, another reason to be thankful for my old laminate countertops (which I sorta hate!). i would also love to see more pics of your gorgeous kitchen! What time of year is that you ask? The time of year when I remember that I never did spend time early on figuring out what we'll be doing for homeschooling this year and so I must figure it all out quickly, make any necessary book orders, figure out a preliminary school day schedule and send in the homeschooling application. It's also the time of year when I flip through the Rainbow Resource phone book sized catalog and the Montessori Services catalog and decide I want to buy everything. Since buying everything out there wouldn't actually help me and would impoverish me, instead last week, I sat down and figured out my basic curriculum for the two oldest, who will be doing first and third grade work this year. I think it will go well, although one can never tell, I suppose. For some subjects, we'll be using the books I planned to use last year, but that we put aside in December when we moved into our house and never picked up again, opting for a more unschooling approach during the spring when we were traveling, renovating and getting ready for the baby. I'm buying a few new books, but not all that much. The subjects I mainly intend to cover are: Mathematics, English, Science, History, Religion, Art, and Music Appreciation. The oldest will also be doing a Latin tutorial. To keep things simpler for me, I've decided to do the same science and history for both kids. I will probably require more from the older than the younger (certainly I will at first, because other than her name the five year old can't write anything yet). Both kids will continue to work at their levels in Math-U-See, which we started using last year and which we have all been very pleased with. For English, the oldest will be continuing on with Serle's Primary Language Lessons and I'm going to try a new book with the first grader called McRuffy 1st Grade Phonics And Reading. Besides doing Sunday School classes at church, we'll continue to study the catechism at home, use Catholic Mosaic to learn more about the Saints and just try to develop a better sense of the liturgical year as we move through it. We'll be doing artist studies every month or so and I'll make up related art projects as we go along and we'll be taking the kids to the symphony and introducing the music and composers they will here there. I'd like to sign them up for piano lessons, but we'll see how my sanity is holding up before I take that step. If I can get all that going along with all the regular reading, thinking and stuff of that nature, I think we'll have a year that covers a lot and in which we all learn a great deal. Sounds like it'll be another great year. If you'd like another kid-size resource about the saints, let me know and I'll send it along. It has a lot of great ideas for projects that work across a large range of ages, and that are about learning art, not just following directions. I've got various things I want to get done today, and if I get them done, I may return, otherwise I present you with a list of my happy things. Zinnias blooming in the garden. Most things are looking a bit tired and crispy these days, but the zinnias are a bright spot at the moment. Losing 27 lbs. of baby weight. Not all I'd like to lose, but it is a nice start. People who brought us dinners for the past two weeks. I'm going to have to start cooking for myself soon, but those meals sure were nice. Getting the stuff ready and sent off for this year's homeschooling application. 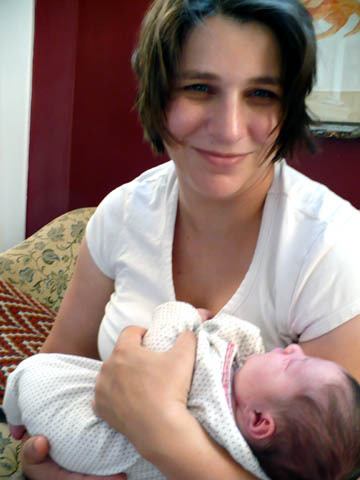 A baby who slept almost all night -- even if it did mean certain parts of me were very uncomfortable in the morning. Passing our electrical inspection. We only have the final upstairs inspection and we can really unpack and settle in up there. So that's what makes me happy. How about you? Zinnias are pretty hardy, and very pretty. We are down to the holly hocks in the front bed, and the forest of black eyed susans in the back yard. After all the rain we had in June and early July, we've apparently emptied the skies as it's not rained in quite a while. You are getting a lot done! I'm so proud of you! Well, the uncomfortable parts weren't making me happy, but the sleep was. The uncomfortable parts do make husbands happy, if only from a visual perspective. That timer is going off because you set it. It is not some strange beeping unrelated to anything in the house. You set the timer so you would remember to turn off the soaker hoses, but if you can't remember that you set the timer or that the hoses are running and can't seem to find the timer on the oven in the kitchen but rather just sit and wonder where that annoying beep is coming from, then you really are spacey. Self, I always suspected as much. This is why people write on their hands. I think you are excused though. You have just a few distractions, you know. lolol I can sympathize. Did you turn off the soaker hoses? Consider this a reminder...in case you forgot...after turning off the timer. I totally hate it when that happens. I have successfully gotten five children out the door and buckled into the car all by myself twice now. The first time was yesterday when I got them out, picked up my husband and left him in charge of the kids while I raced to my doctor's office a few minutes before they closed to verify that I did, sadly, have a UTI as I had suspected. As if recovering from child birth weren't bad enough by itself! Today was more fun, but also more work. I decided that we all needed to get out, so I suggested to the bigger kids that if they were to straighten up the living room, sort out the library books and put their shoes on, we might be able to make it to the library. That spurred them into action, because they love a trip to the library. I think it took us about an hour from my proposal of the outing until we were actually headed out the door, but we weren't working under the pressure of any schedule so that was fine. The baby slept in the car on the way there, in the sling almost the entire time walking around the library (except when I sat down for story time, but she nursed and went back to sleep) and so she was primed for a wide awake, screaming fit on the car ride home. Fortunately, the ride isn't too long. In the meantime though, we got to show her off to some of our favorite librarians and check out a new supply of approximately 50 books. It always feels good to get fresh reading materials. I wanted to stop and get something for myself, but I knew I wouldn't actually have a chance to read anything right now and so passed by the grown-up section. I'm not sure how an outing where we have to be some place at a certain time will go, nor am I excited about venturing out to the grocery store with all five children in tow, but I'm glad to know that I can make it out the door and bring them all home in one piece. I am so glad you got out of the house and had a decent time of it! I still haven't mastered getting three little ones very many places on time. Actually, even my three year old can buckle up her five point harness most of the time. Getting them to do their own carseats was a priority. She can't always manage, but she gets it 95% of the time without help, which is a huge thing for me. I know you have even more carseat issues than I do, since I can work the buckles without pain, but maybe your husband could work with the Jay to teach him to do up his buckles? Here's a slideshow called "Classic Beauties: How They Aged." Some of the beautiful movie stars of yesteryear aged well. Some did not. What's really telling though, is that all of them aged. They do not look like strangely taut, alien versions of their formerly youthful selves. They look like real people who got older. It doesn't seem like movie stars allow themselves to do that any more. Interesting slideshow. I noticed, though, that Hedy Lamarr seems to have pretty clearly had some surgery. Her face does have that stretched look, and her lips stick out funny like they've been plumped. Otherwise, it seems the best way to age gracefully is to not wear too much makeup and make sure you've got a good hairdo. Note as well how long most of those women lived - with all the odd chemicals pumped into some faces these days, I half expect them to have chemical meltdowns before they are old enough to join AARP. Susanna is right - soften up on the makeup, make sure your hair looks good. I wish I could look half as pulled together as those older women. It seems to be common practice among women to get their hair cut shorter as they get older. But many of these classic beautiful women wore their hair pulled up instead. I like that look; it seems a little softer than a lot of the short styles. May I be the first to say, "aaawwwwwwwww"! What a cutie! she is so sweet. looks to me like you are spending your time VERY wisely!! (she looks well fed and happy!) and hey, when you get some more time, lol, you can add another cute character to the cartoon pic at the top of your page! She's just gorgeous. How I would love to have a beautiful little girl to dress in pretty little baby gowns! I guess that's why I have nieces. A week has gone by since the not-so wee one was born. She's doing quite well, sleeping most of the day and night. Her nursing is rather vigorous, but the cracks I developed in the first days are getting better and I don't wince at the thought of her latching on any more. She's awfully sweet, although since she pretty much wants to be held 24/7, I never feel free or able to get much done. My husband had this first week off from work, which I enjoyed. On Friday though, he did have to go out and do work related thing. I started out ok, sending the bigger kids outside to play in the sprinkler and pick tomatoes. But later when the littlest came inside and got into one thing after another -- dialing the phone, throwing the freshly picked tomatoes all over the kitchen, etc. I was ready to give up. It's really hard to chase down and manage a very busy toddler when you are one handed and holding a baby. My older kids are big helpers. They hold their sister when I need a minute to get something done. They help with the laundry and other tasks, but they are kids themselves and sometimes they too can be the source of extra craziness. Crazy and loud, full of adjustments and all, this first week has flown by far too quickly. I'm settling in a little, but it's going to take me a while to figure out the care and management of five. She sounds so sweet! I hope the transition starts to get easier! It sounds busy but fun!! Hang in there! I'm so glad the worst of getting back into bfing is over. Oh, how that hurts! I think I was much more sore with Daniel, and I wsa using the soothies and the lanolin, and then I got an infection. =-P Soothies and lanolin weren't doing much for me anyway! All through the latter half of my pregnancy, we got frequent inquiries about what name or names we had chosen and surprised looks when I would tell people we hadn't really come up with anything. Eventually, I had whittled down the list of boys' names, but nothing I had on the long list for girls was quite right. Then my grandmother-in-law died and was buried the day before our daughter was born. Although none of my other children have family names, it seemed appropriate to remember my husband's grandmother in naming this little one. We did not go with exactly her name, but chose a variation on both her first and middle names -- winding up with us naming new our daughter Juliana Caroline. I think it suits her well, although I do fear it sounds a bit like my name and might some day get confusing. Although, I am generally not one to be superstitious, perhaps she was born when she was and perhaps we had no decided name for a reason. It all came together in the end. That is a beautiful name! That's a beautiful name and a very sweet remembrance. Wonderful and congrats to all! Juliana Adams -- that trips along nicely. Congratulations!! 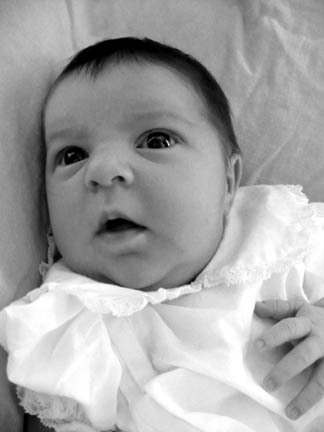 What a beautiful baby girl, with a beautiful name! Love it! Great choice for a name! Hey, Jordana!! Beth emailed the info. Congratulations!!! WOW! You look fantastic. Yeah! I went to the hospital on Saturday morning dilated to 4 centimeters and 80% effaced. This time around I wanted to try laboring without an epidural and in order to help me with that goal, I brought along not only my husband but a friend, who is thinking about training to become a doula. Labor was not terribly uncomfortable and I was managing very well on my own. My doctor came in around noon and offered to break my water, but having heard that labor gets a lot more painful once your water breaks, I decided to wait on that and let it break on its own. By about 2:30, I was getting more uncomfortable, but coping pretty well with the contractions. My doctor came in at 2:50 and checked my progression. I was at 7 cm, but the baby was still at -1 station. Going back over my other labors, which he had all his notes on, it looked like I would probably have another 3 or 4 hours. About a minute after the doctor stepped out of the room, my contractions became unbearably painful and I decided I no longer could manage without pain medication. The nurse called for an epidural and about a minute after that I started wailing and telling everyone it was too late; I'd waited too long and that I was pushing without wanting to. They told me not to push, but I wasn't pushing voluntarily. The nurse checked and the bag was bulging, her head was right there and I was ready to deliver. All while I was screaming for pain medicine that I knew wasn't going to be coming. I had gone from coping quietly, breathing deeply and being able to relax, to suddenly being in one giant contraction, not being able to relax at all and definitely being noisy about it. My doula told me the baby would be there soon and I told her I didn't want the baby -- and at that moment, I realized I would not handle torture very well. Apparently, I'll even sell out a baby to stop pain. It was not my finest moment and I suspect I scared every other woman in Labor and Delivery into requesting an epidural immediately. My water broke, just as the baby was crowning, and my doctor was telling me to stop pushing so hard so I wouldn't tear too badly (and I wasn't trying to push at all). 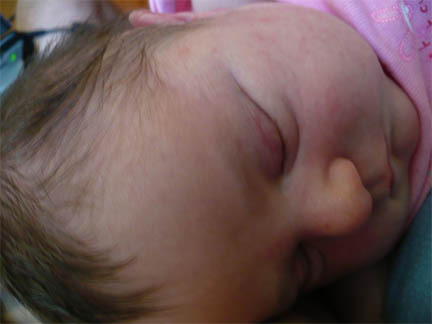 And there she was with a full head of hair and multiple chins, only 17 minutes after I had been at 7 cm. I really thought she would be a boy and my doctor thought she'd be around 8.5 lbs. We were both wrong. She missed being my biggest baby by an ounce -- weighing in at 9 lbs 1 oz. Hitting transition and having it go so hard and fast was scary. I wouldn't like to repeat those last 17 minutes any time soon. On the other hand, if transition is always that painful, I'm glad it didn't last long. I know the last part of my labor would be enough to have scared me off from considering natural childbirth for a good long while in the past, however, I did learn something from the experience -- at least for me, the recovery after a non-medicated birth is remarkably better. Within a few hours I felt almost human again and could get up, move around and although definitely exhausted I didn't feel like I was nearly as worn out physically as I had been with the others. I won't say for sure that I wouldn't get an epidural the next time, if we do this again, and I would have really, really liked to have it while I was in labor. We'll just have to see. There were definite benefits, though, to making it through without pain meds. She's beautiful, and you are too! What a great birthing story. Congratulations! Oh my gosh, Jordana, she is BEE-OO-TIFUL! Oh, it makes me miss an infant. Congratulations! You look great. So happy. For my second pregnancy I had a paracervical block and it was amazing. I'm pretty speedy in the delivery roomand this was just enough to get me though. And I was up and walking not long after. For my third time around I had no choice, with twins I had to have an epidural. Max (twin A) was head down and ready to go, but Miss Rebecca was breech and needed to be turned after she kicked her brother out. Fortunately there was plenty of room after Max left and I did not have the double joy of both a vaginal and cesarean delivery. Congratulations!!! Good on you (as the Aussies say) for toughing it out. You rock! And your new daughter is just gorgeous. I can't say I'm not jealous. Just a little. I'll post more about her birth, size and all that later. Congratulations! You both look so lovely in that picture. She also looks BIG. Maybe she needed the extra growth time because she knew she has older siblings to keep up with? I'll be praying for a smooth transition! Thanks for posting this lovely photo. Congrats! Where did all that dark hair come from?! You sure you picked up the right one from the nursery? Much congratulations! Look at all that precious dark hair!! Adorable!! Congratulations!! Glad to hear she finally arrived. I've been away for a couple of days and one of the first things I wanted to do when I got home (after kissing the kids etc) was to check whether you had had the baby. What do you have now - boys/girls I mean? Came out of hiding to wish you a joyous recovery. Wonderful news! And what a healthy-looking baby. You look super too! Congrats! Hope you are both feeling well! Congratulations to the whole Adams family! How delightful! She looks very cute. Welcome to the world, little Adams! What a lovely photo...beautiful baby and lovely happy mum! Congratulations! What a beautiful girl with such a lovely and proud mommy! O ALMIGHTY God, we give thee humble thanks for that thou hast been graciously pleased to preserve, through the great pain and peril of Child-birth, this woman thy servant, who desires now to offer her praises and thanksgivings unto thee. Grant, we beseech thee, most merciful Father, that she, through thy help, may both faithfully live, and walk according to thy will, in this life present; and also may be partaker of everlasting glory in the life to come; through Jesus Christ our Lord. Amen. Congrats! You did so well. She is a beauty! Although I would love to have a clean, well-organized house right now, we have instead reached the point where we can empty the POD that we've had forever. If we get it emptied and taken away by Monday, we won't have to pay for another month. On the downside, we actually can't put everything away yet. So basically, we're just bringing more stuff into the crowded rooms and making a bigger mess than before. Just what the stressed out, over due pregnant lady needs! Of course, I am fully on-board with this course of action, even if it is making the house a wreck, because I can see a lot of value in saving the rental price of the POD and unloading it and carting it away will make me very happy. Even so, I wish I could have the tidy spotless house (if only for a short while) that one dreams of when about to have a baby. Just make sure at least one room looks clean from one vantage point. That's what I did after D was born. Then I could sit on the couch in the living room while I nursed him, serenely looking at a clean room, and just pretend the rest of the house looked the same. Woman what are you still doing here? Every time I check in, I expect to either see news that you have had the baby or silence because you are too busy having the baby to tell us about it. Congrats on the unloading! Maybe nice people will surprise you with having every thing put away when you return from the hospital with the baby. Although I can't imagine a house can ever stay very clean with 5 little ones. And sorry about your grandmother-in-law. 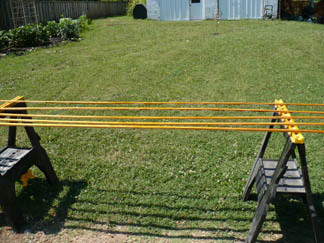 On the upside, your back yard will suddenly look five times bigger! Perhaps you should move the rocking chair under the plum tree for the rest of the summer. First of all, in case anyone is wondering -- I'm still pregnant. I blame my friend Frazier for predicting the child's birthday as being July 15. Who knew she had so much power? Second, my grandmother-in-law died yesterday. Unfortunately, she lived and will be buried about two hours from our home -- too far for me to travel at present and probably too far for my husband as well. We are thankful though that we got to see her and say goodbye to her here in Nashville. I wish I had had the chance to introduce her to her fourteenth great-grandchild. I'm sorry to hear about your husband's grandmother, but glad to hear you got to be with her to say goodbye. There's an old saying about a new baby being born at/around the time of a death in the same family. Guess it still holds true, sad though it is. Praying for you. This is a hard time, waiting, even without the mourning. Praying for you. Hoping that baby comes soon too. Hang in there. And sorry to hear about your grandmother-in-law. Im so sorry to hear about your loss! Do I win?!?! I was right on gender and awfully close on the date! Do the people who drive ice cream trucks go insane by the end of the summer or are they already deaf? Not as deaf as those parents who have the kids with squeker sneakers! Maybe they start a bit crazy. That's my guess. They make me wish I were deaf, because they drive me insane! Also, what is up with the circling of the neighborhood at, like, 9:00 at night? When my kidlets at least SHOULD be sleeping, undisturbed by jangly music and a pre-recorded voice repeating, "HELLO? HELLO?" My eight year old discovered the state quarters recently, when his great-aunt from Arizona gave him a newly minted Arizona quarter. Since then he has become some what obsessed with his collection of state quarters. His collection has grown rapidly. He hit up his grandfather for quarters and came away a great start to the collection. He's been doing extra chores and saving change to buy state quarters from his parents and when we recently went to a grown-up friend's birthday party, he told the guests he was collecting the quarters and came home with eleven he didn't have yet. If he were only collecting coins, this wouldn't be much of an educational experience, but he's used his collection to start an interest in the history of the states and when they joined the Union, and also US geography. Thanks to a book called the Scrambled States of America and his quarter collection, he's really getting a sense of the US, where the states are located and generally what's what. This morning I offered to print out a blank map for him so he could fill in the states. He was thrilled at the idea and sat right down to fill it out. He wasn't perfect. He mixed up New Hampshire and Vermont and on the first try moved Georgia to Missouri. He also needed to be reminded that state names are proper nouns. I didn't start learning states and their capitols until fifth grade, so I think my rising third grader is doing pretty well, but I always new he was a kid who liked to learn on his own and he needs only a little help a guidance to get ahead. I didn't devise this US geography lesson, but I think it has actually been a great system for getting a kid interested in the States. The knowledge he's gained has been rather costly to his friends and relatives though. I dunno - moving states seems like it could have benefits. Maybe we could move certain politically leaning states to where they truly belong. Say, California to Cuba, for instance? It would certainly cut the travel time to go see my in-laws. Scrambled States is one of our bed-time regulars. I usually read it doing my Hal Holbrook voice, which seems to fit pretty well. Since you're interested in art, you could debate the merits of the various state motifs on the backs of the quarters. Virginia's is a lovely flotilla of ships. Louisiana's is a mishmash of mixed themes. This morning I woke up early and realized we had a voice mail on our phone -- a voice mail that hadn't been there when we went to bed. Most of our phone ringers are turned off, because they have a tendency to ring and wake up napping kidlets, but this time it was the grown-ups who slept through the call. When I woke up around 4:00, I checked the phone and got a message from my mother-in-law that her mother-in-law (my husband's grandmother) was in the hospital and my in-laws were headed north from their home in a far southern state. Through more phone calls, we learned that the situation was serious and unlikely to get any better. Since my dad is here in town staying with us, we left him with the kidlets and headed over to the hospital. My grandmother-in-law had something happen yesterday -- they don't know for sure what -- but it left her with severe bleeding on the brain and probably brain dead. The doctors took her off the respirator, but this beautiful woman, full of so much life and vitality, has a heart that keeps beating and lungs that keep breathing steadily on. No one knows for sure what the time line will be. And so we stood together and chatted as families do. Crying at times. Laughing sometimes. Thinking about all the stories one can tell about a person who has lived a long and full life. I'm relatively new to her life, having only known her about 14 years, but she's been such a lovely person to know in those years. I've learned a lot about gardening from her and owe most of the day lilies in my garden to her. I was hoping some time to go up to her house again and divide more plants, but I have so many already that I can look at and remember her and the corner of the world she filled with flowers and beauty. She also loved books and loved to give books to her great-grandchildren for all occasions. We have those to help us think of her often. It seemed and still seems wrong that we've been in the hospital much of the day for the wrong person. I've been planning to go to the same hospital any day now for weeks. Planning to welcome a new person into the world. My plans never involved watching someone leave it. life is incredibly good at throwing us what we least expect. I'm sorry to hear the news, what lovely memories you have of her. i saw your sad update on facebook just now and rushed on here to see what it was about. I'm so sorry to hear it. My prayers are with you. My condolences. You continue to be in my prayers! I wish my husband had gotten the privilege of meeting my grandparents. My paternal grandmother's father fought in the Civil war. He was in his 60s when my grandmother was born. Needless to say, he didn't make it to 1973, when I was born. Waiting on the baby is driving me crazy. I was going to say "slowly insane" but the descent into madness is happening faster rather than slower. I try to teach my children patience, but I'm afraid in this instance I'm the one without any. Eeek its so hard to wait!! You know what I am going to say. . .lol. Are you overdue yet? Castor works a treat. But patience works experience, and experience hope, which makes us not ashamed. Hang in there! I'll pray for you. The Eight Year Old: What is it we celebrate on the Fourth of July again? Me: Our independence from England. The Eight Year Old: Oh right. Shouldn't we call it Independence Day then? 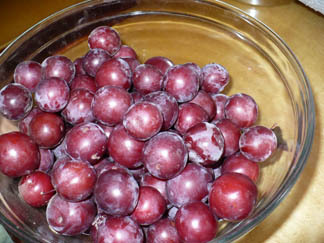 In our backyard, we have two purple leaf plum trees. Everything I can find out about such trees is that they are largely ornamental and fruit from them is "negligible," however this year our trees produced fruit. It's true that the branches aren't bent and breaking from a surfeit of plums as I've seen some plum trees do when they produce, but it's more than enough to meet our needs and wants. I've never made any kind of jam or preserve before, but I think the kids and I might try this freezer recipe. And maybe make some plum bread as well. Or maybe we'll just eat them all. Ay, wots that, no plum puddin'?! 'Aven't you ad yore meat first? At the Taterbed the Spuds are enjoying the first real harvest from our 4 blueberry bushes planted in front of the house (we had a few handfuls last year). On Tuesday we picked off nearly a half gallon, and I'll probably go pick some more tomorrow morning. This was primarily from two of the bushes. The other two are a different variety and are ripening a little slower, which is OK as it will extend the blueberry eating season. One of our hardwired smoke detectors wasn't actually wired correctly. About 2 a.m. the back-up battery gave out and it started beeping every minute. My husband got up and took it down, but I didn't get back to sleep until 5 and then slept until 7. Long hours of insomnia are really getting me down. Oh, I feel for you. With every nerve in my body. Try the castor oil? It really does work. And it means you won't be pregnant much longer. Thanks, Henrietta. I was feeling desperate enough the other day that I went looking for castor oil at the drug store and couldn't find it. I wonder if it is kept some place funny in our stores. I actually slept last night - I think I was so exhausted that I just passed out. But I woke up feeling like someone had kicked the crap out of me. Everything hurt and ached. I think the sleep was worth it though. I'm sending(easy) labor vibes your way! 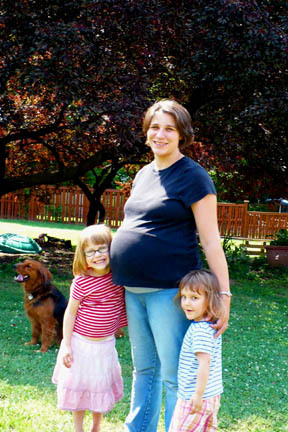 I can't speak for all crazy pregnant women; ones who are smart enough to know not to mow the lawn and things like that. I can actually only discuss the crazy things I do, and actually I haven't been that crazy lately. I'm too tired. I had really hoped that before the baby arrived, the upstairs of our house, which was originally an attic, built out in the 1960s or 1970s and gutted by us, would be completed and the kidlets sleeping up there. We're very, very close, but it isn't looking likely to happen now. 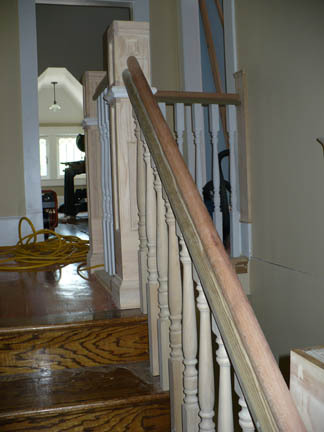 For a long time, one of the major things holding us back was a railing on the upper half of the stairs and around the landing. When my dad came a month or so ago, he and Justin built that and solved a major safety issue. 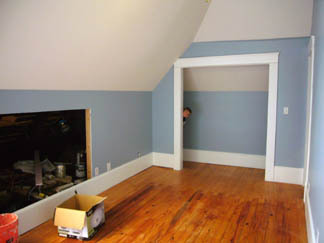 After my father left, Justin put the base shoe in one room and then set about working on the attic access doors. Because the roof on our house is a pyramid shape, there is attic space around the sides of each room. 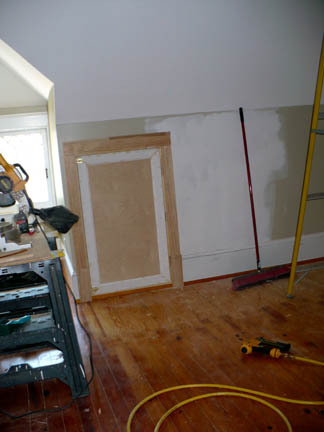 When we framed and drywalled the rooms, we weren't sure what we were going to do with these areas exactly, so we left them open 60" wide and ignored them for a while. Then Justin framed out the space for a 30" doorway, drywalled the rest, built jambs, doors and hung them up, and put up trim. My dad is back helping us out again and standing by should the wee bairn decide to arrive. While Justin was working on trimming out the doors, he's been putting up more base shoe. We had enough for 2 1/2 rooms, but we needed to buy more for the last bedroom and half of the bathroom. Yesterday, during all my errand running, we bought the necessary trim and last night started putting shellac on them. You can get into all the enviro reasons to like shellac, but mainly I find it very handy for things like this because it dries fast and adds color to the wood at the same time as the finish. I'm all about being lazy. Today, I gave the trim a light sanding and put on a second coat. That's where the crazy pregnant part comes in, although I worked outside and finished up quickly, so I don't think it was that crazy. The trim for everything but the last part of the bathroom (that trim will be painted) is now ready to put up. We're waiting on our final HVAC and electrical inspections. We've passed the final plumbing inspection and I think all we have to do for the final, final inspection is get all the doors hung. Of course, hanging doors isn't exactly what one would call simple when one is dealing with old doors and not pre-hung ones, but we are awfully close. As much as I'd have liked to be finished before the baby arrived, at this point I would rather be done with pregnancy than have the upstairs finished first. Physical discomfort can change your mind like that. You have gotten a lot accomplished for being "lazy" (not!) and pregnant! I mowed the yard (Much much smaller than your yard) twice a week once I was overdue because I was hoping I'd go into labor. I'm sure all the neighbors thought my husband was a cad for not doing it and making me do it. I never did go into labor though. Lazy you are not! My cousins created a Hogwarts' style pull out bookshelf in an attic space like yours. The kids love to pull the bookshelf out, get behind it and pull it back in (handy pulls were put on the back just for that purpose). It's so funny to hear sounds of kids playing coming from the walls. Beth, that would be awesome. Our attic spaces aren't air conditioned or finished in anyway though and don't even have sub-floor laid over the insulation. Maybe some day though. Oh wow thats alot of stuff done! What you've shown looks beautiful so far! Frustrating not to be as far along as you'd like (with either the remodeling or the incipient labor). I can give you some links to things we won't be using. Thanks to Kelsey for the list of the 10 Strangest Baby Names Ever, all of which I can guarantee will not be used for this child. I've linked to this other site before, but if anyone wants to read other names I will not be using, you can pop over to Baby's Named a Bad, Bad Thing and read the hilarious commentary on many, many very bad naming choices that people sometimes make. As for what the baby will be named -- well, that's a lot more difficult to say. Thanks for the linky love! Have you thought of any names yet? I got my eight year old to snap a photo to preserve a view of the current girth I'm carrying around. The camera adds 50 lbs, right? The night before last I had a lot of contractions, but they never got all that painful, so I kept my 8:30 morning appointment with the doctor. Sadly and much to my disappointment, those contractions had done absolutely nothing. I had been up most of the night and even woken up my husband, and all for nothing. After the doctor's visit, I went and walked around a great park not far from our house and then pretty much napped most of the rest of the day. Last night, I didn't have any contractions and I haven't had much of any today. Today, I ran all the errands I could think of that needed to get done -- Lowes, Sam's Club, and the grocery store. I feel like I walked almost the whole day, but no signs that a baby is planning to show up any time soon. So that, if you are wondering, is where things stand on Baby Watch 2008. Your baby belly may be big, but look at those skinny arms and thighs. I almost can't believe you're the mother of 5!!! You are all baby belly (she says with envy) - but you do look like it must be getting uncomfortable. Hopefully the baby decides it is time quickly!